AWESOME! its a lot like that tiberian doom mod!i loved that mod! Trying out the new vehicles and stuff in some combat. Player can buy the vehicles from the Base with Credits. Each vehicle & pilot has 3 weapons. It's possible to exit the vehicle and enter another. If the vehicle is destroyed when player is in it, the ejection system may activate. There's also the new chase cam, and some more spinning on the player. The spinning is only visible in chase cam view. The chase cam is a bit unplayable: there's some conditions where it gets right behind the player.. and then there's some conditions where it gets stuck in the ceiling, yet the code thinks it's in the right location. Ok, since the chase cam has issues, I just put the player models as the view models for first person. Then it's easier to know which vehicle you're driving.. but then the weapon model isn't displayed in the model. Only displayed in the statusbar. Also I had to change some of the rapid fire weapons into traceline/hitscan weapons. Visible entities (including the ones that are not currently visible to player) generate netpackets and WinQuake is very limited with how many netpackets can be in a frame. Don't know how well the spacecraft's laser and plasma are going to work. In some heavy action they might overflow. Easier to happen if it's also a long area, so they can travel longer time before hitting anything. This netpacket stuff is pretty ridiculous... Maybe I should change back to some less limiting engine. 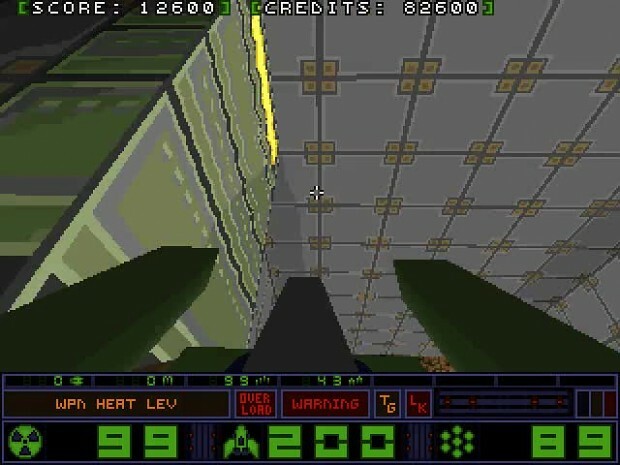 WinQuake is also a bit crap on how big the levels can be. That long tunnel at the bottom is 8192 units long, which is the max. With the spacecraft player can fly through it in 12 seconds.